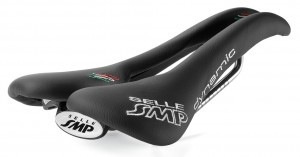 Selle SMP is developed in association with a medical team of urologists and andrologists. The results obtained by researchers demonstrate the SMP4BIKE saddles guarantee optimal genitalia blood flow and are now the best solution on the market to achieve the highest performance with the greatest saddle related health benefits. Pressure relief area distributes along the whole length of the saddle, from the rear to the tip. Whatever the cyclist's position, it prevents delicate perineal structure compression, avoiding vein and capillary vessel occlusion and the chance of nerve injury.